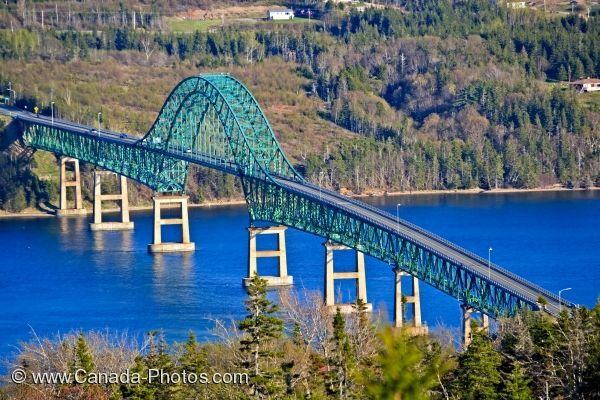 Since the construction of the Seal Island Bridge in 1961, travel around Nova Scotia, Canada has become much simpler and quicker. From the overlook on Kelly's Mountain the entire bridge can be photographed with some of the surrounding area which include parts of the Bras d'Or and green hillsides. View from the Bras d'Or Overlook on Kelly's Mountain overlooking the bridge over the Great Bras d'Or Highway 105 in Nova Scotia, Canada. Picture of the Seal Island Bridge and the Bras d'Or from atop Kelly's Mountain in Nova Scotia, Canada.